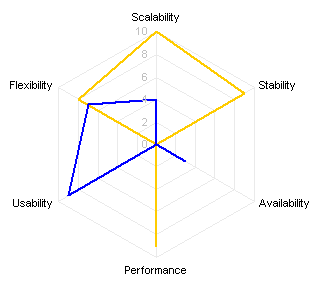 It actually seems that the petal chart is even worse at allowing comparisons than the lowly radar chart. 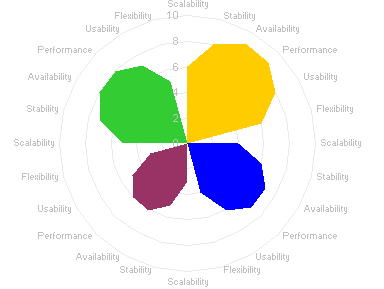 At least in a radar chart, the items being compared are all along the same spoke, whereas in the petal chart, they are distributed around the circle, 90° apart in this example. Also, the false zero values on either side of the categories for each petal can be distracting. 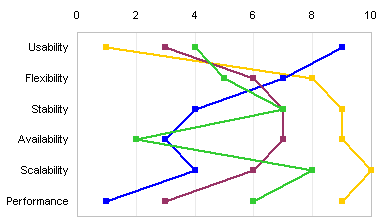 Derek rearranged the data to impart a diagonal trend to the chart. He likes spot matrix charts, but I’m not really wild about them. Bertin liked to use a stack of column charts to show this type of data, and I think I prefer Derek’s stacked chart to his spot matrix. 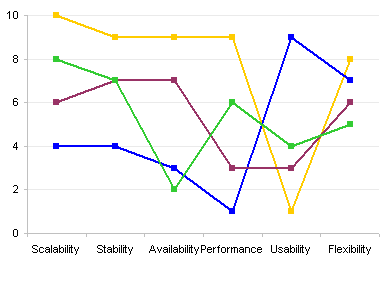 Shrink the stacked chart a bit, and it becomes a sparkline. 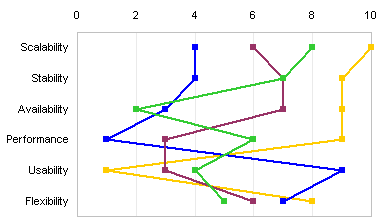 The line charts and dot plots are improved somewhat by the ordering. 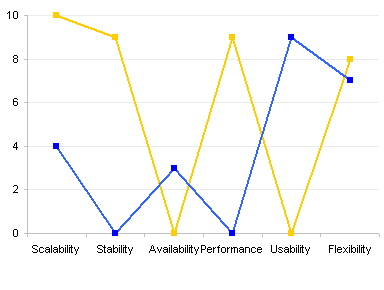 The sorted data makes it easier to see that the yellow line (option 1 in Derek’s charts) is good in all areas except for usability (probably the worst category to rank poorly in). 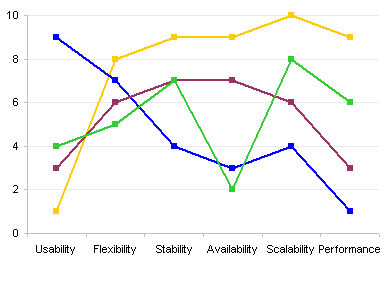 The blue line (option 2) has outstanding usability, but it’s at or near the worst in four of the other five categories. 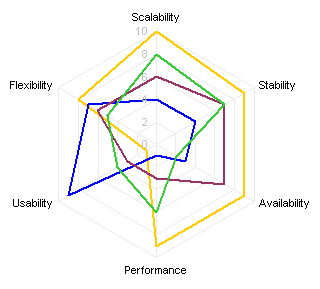 Bottom line: Radar charts are not too effective for what they are often used for. 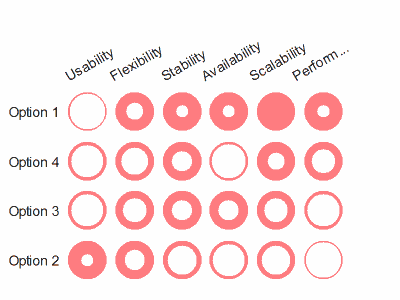 Chandoo made a noble attempt to improve on them, but sticking to a chart with a circular shape wasn’t a good move: the petal chart looked nice, but it was even less effective at displaying the data. Line charts are one of the best choices, though Derek presented a couple good alternatives. Derek’s sorting of the categories helps to bring out patterns in the data, in his charts and in the line charts. Posted: Friday, October 3rd, 2008 under Chart Types. 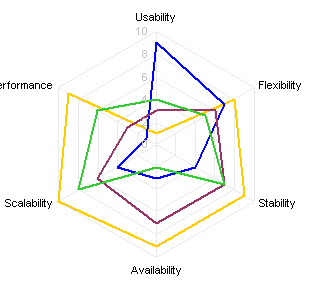 Tags: Bad Charts, Chandoo, Derek, Line Chart, radar chart, spider chart, spot matrix. For me, the rule of thumb about charts is that your audience should be able to grasp the main insight in 30 seconds or less. And — even after 5 minutes of staring at a radar or petal chart, I still have no idea what the main takeaway is supposed to be…..
And the other line graphs — just as bad, in my opinion. Now, the spot matrix chart — that I understand. 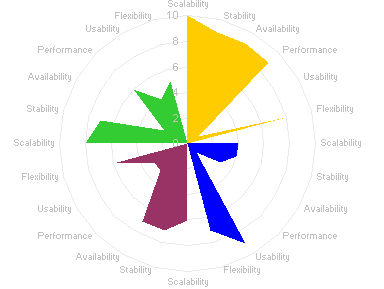 This kind of graphic is actually somewhat familiar. I believe that I’ve seen similar ones on sites that compare and review consumer goods like electronics along various dimensions. I do not think, however, that the options should be presented out of order. 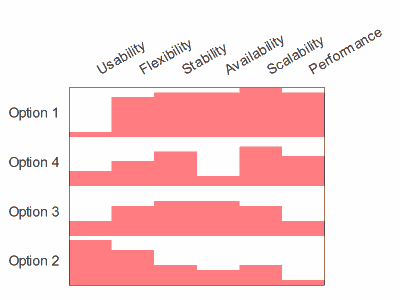 Now I am all excited about the spot matrix chart. 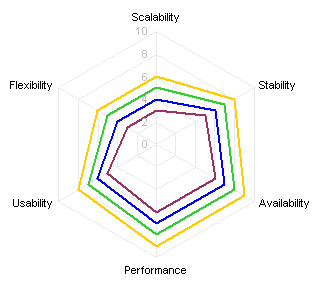 It might turn out to be a really good replacement for a stack of five, independent bar charts. I understand that you don’t really like them, Jon, but (off the top of your head) do you have any insight on the best way to construct such a thing in excel? Go to Derek’s post at Reorderable tables II: Bertin versus the Spiders. He probably has a link to his spot matrix resources. Once the decision is made to make a grid, there are a wide range of alternatives. Your spotlight, which is like the spot matrix, which is like Harvey Balls, which is like your tile chart, which if you expand the tiles to fill the grid is like a heat map. 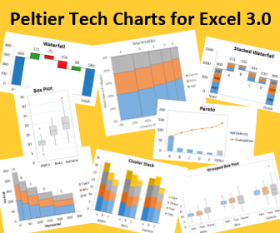 Hello, I’m trying to create a vertical line chart (or dot plot) in excel. Do you of any place I could find that tutorial?? One type of chart that may also be helpful is a bubble chart. : I tailored one to provide 4 dimensions. X and Y axes are the primary considerations, bubble size (I only had 3 sizes) indicate another dimension, and then 4 small “hierarchical” type structures on the diagonals of the bubbles to indicate a complexity dimension. Simplicity had a single spark, moderate complexity and a spoke with a ‘V’ shooting off it, and complex had a ‘V’ off each tip of that V making the bubble appear more like a molecule. Each bubble was the alternative under consideration and I had about 12 bubbles at varying positions, sizes and “molecular fuzziness”. Since I was in PowerPoint, I animated their appearance to simply appear one at a time so as I spoke, people knew exactly which one I was talking about. Your views on this will be valuable!